Here's a great Director's Commentary centering on the new Boeing Dreamliner. 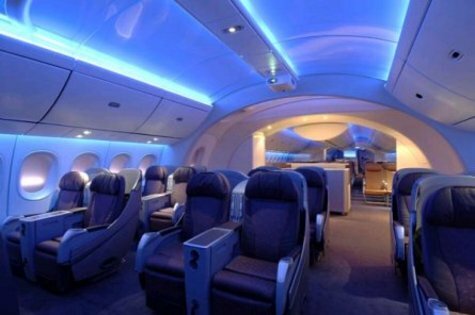 In this video interview, Fortune's David Kirkpatrick interviews Teague CEO John Barratt about the development of the Dreamliner's passenger experience. I enjoyed hearing about the design process used to get to the final result, which looks quite promising. Though I have to admit that at a personal level I'm a bit reticent to fly in a plane made largely of carbon fiber, I do admire Boeing's return to a structural paradigm pioneered by aircraft of seventy years ago, such as the innovative Lockheed Vega, piloted by the equally groundbreaking innovator Wiley Post. I had the pleasure of meeting John at DMI's International Design Management Conference last year, and we will both be speaking at a Marketing Science Institute conference in October. So, apparently there was some discussion from the engineers on whether to bend stress test the wings for the Dreamliner to the point of failure. Then someone did that calculation and discovered that they could likely bend the wings upwards to the point where they touched. I specially liked the idea of some projects as "mind-stretchers": the sonic cruiser may have never been, as a product, more than a drawing. But, as an idea, made possible a brand new way of thinking airplanes. "Once your mind it's been stretched, it's hard for the mind to contract again" Great quote.